synopsis (EN) Every hundred years a comet passes over the Mushroom Kingdom and rains down stars and stardust, and as Princess Peach and the citizens of the kingdom are celebrating the centennial event, Bowser and his legions attack by launching asteroids at the Mushroom Kingdom and crystallizing the Toads! Knowing that Bowser is after Princess Peach, Mario runs to save her. Things go awry as Bowser summons a massive spaceship, abducts Peach's entire castle and hits Mario with a massive magical attack. The next thing he knows, he finds himself on a mysterious moon high above the Mushroom Kingdom! 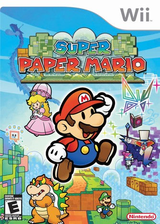 Navigate Mario through a bevy of exciting new worlds and the depths of space, with all new enemies, power-ups and attack skills, as he collects the Stars needed to save Princess Peach! synopsis (ES) ¿Existe algún lugar tan, tan grande que dé cabida a la mayor aventura de Mario de todos los tiempos? ¡Pues el espacio exterior! Super Mario Galaxy es la nueva entrega de la larga serie de juegos de plataformas de Mario, y va a cambiar tu percepción de los videojuegos para siempre.